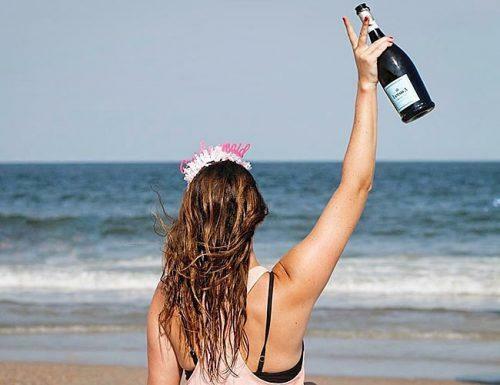 A bachelorette party is a great moment for your gang – it’s time to get really wild on your last single night together! 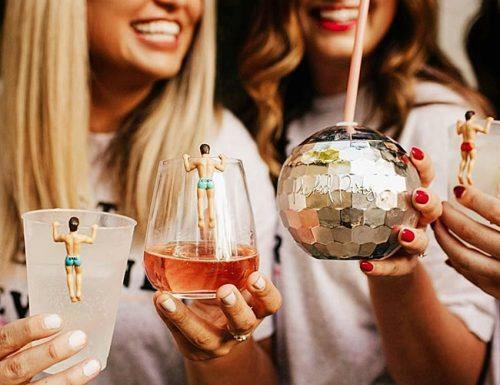 No wonder that bachelorette party drinking games are on the top list of ‘to do’ for a hen party. 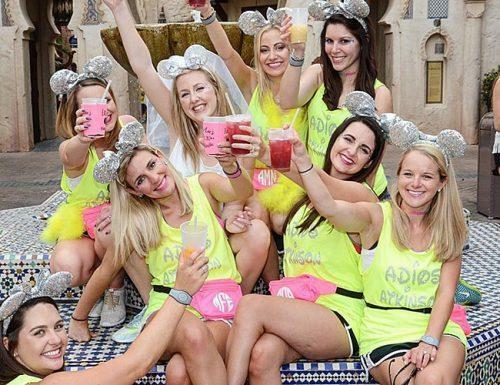 It is kind of easier to play naughty bachelorette party games and answer funny bachelorette questions when you have had a shot or two. Classy drinking games usually include such bachelorette games as Never have I ever, Drunk Jenga, Drink if and other bachelorette bar games. 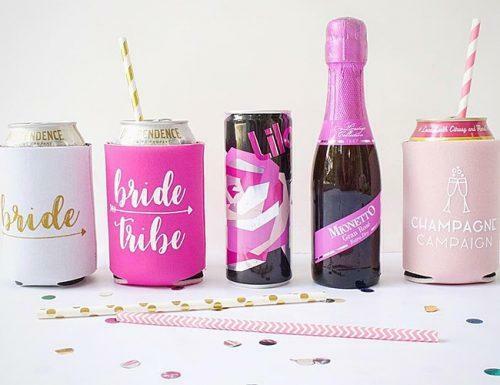 We are happy to present the ultimate collection of bachelorette party drinking games for the best night with your girls! BONUS: Check our infographic with more funny drinking games we’ve made special for you! Basically, this is a game for the bride and/or her Maid of Honor, but if the party is not too big, everyone can participate. This bridesmaid drinking game requires a bit of preparation in advance. You are going to need a hand-made spinner and glasses of different alcoholic beverages. If you are too lazy to make spinner yourself, you can borrow the one from Twister, changing the fields to names of beverages. To keep the game light you can use water, wine, beer, champagne and most popular cocktails the bride likes: Manhattan, Mojito, Bloody Mary etc. To make it more challenging add liquor: vodka, gin, tequila, whiskey etc. The player (or players) takes turns to spin to see if she gets a drink of water, wine, beer, shot, mixed drink, or champagne. You can add more fun to the game by making it a ‘True or Dare’ – just prepare a list of funny bachelorette questions and make the players answer them in turns. If they don’t want to answer start spinning the wheel! This little twist is sure to add extra fun, as the player answering the questions gets more and more drunk! Time for confessing all the dirty secrets has come! But remember – what happens at hens party stays at the hens party! One more game that will help you get to know each other better. Again – you are going to need some alcohol. A lot of alcohol, actually – enough for everyone to have at least 10 rounds. It might be beer, wine, shots or cocktails, depending on your taste. Prepare a list of typical drinking games questions about life experiences. You can control the level of naughtiness yourself – from something totally innocent to the most intimate dirty secrets. All the questions should start with ‘Bottoms up if’ – if you have ever seen ‘Never have I ever’ you got a general idea. 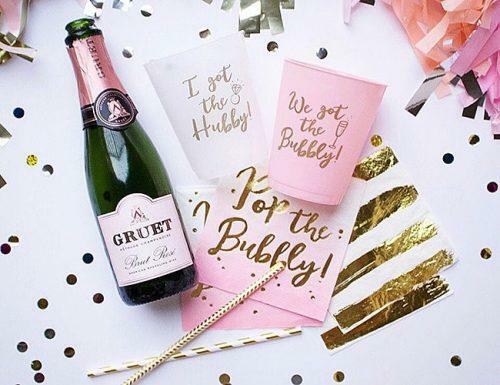 The rules are simple: the maid of honor (or the bride) reads the questions outloud, and the guests drink if they have had this experience. The examples include ‘Bottoms up if you have been married more than once’ to ‘Bottoms up if your significant other has a name for his private part’. It’s up to you to decide what to include in the game, but it’s wise to keep in mind how close the guests are to each other. Another thing to consider – do not forget to ask the bride if she is OK with the list. After all, it is her party and she should be comfortable with its content! This is a classic drinking game. You are going to need 2 shot glasses, 2 quarters and beer. The game starts with players sitting around the table, and 2 players who start sit across from each other with a shot glass and a quarter each. Starting at the same time, they try to bounce the quarter into the shot glass. The objection of the game is to bounce a quarter off the table and into the shot glass. Once you get the quarter into the shot glass you pass it on to the person on your left, and they do the same thing. If someone can’t get their quarter into shot-glass before the other shot glass catches up to them, they have to take a shot. The catch is if someone makes their quarter in on their first try they can pass the shot-glass to anyone they want at the table, usually the person to the right of the other person with the shot glass. The players continue until they feel that they need to tap out. The last player to be left when everyone else taps out wins! This game requires some preparation. You are going to need blindfolds for every player, a timer, and also a variety of beverages. You might include liquor, non-alcoholic beverages, such as water, coke, juice etc, cocktails and shots. The idea is very simple: all the players sit around the table with their eyes closed. The host blindfolds them and passes on different drinks. Players are allowed to smell liquids and take small sips. The time limit from 30 seconds to one minute is set, after which the drink is passed over to another player. After each player had a go they need to call out the name of the drink. Every time a player guesses the drink right, she scores one point. The person with the most points wins. You can try to make the game even more challenging by varying the drinks. Straight drinks make guessing easier, while shots and cocktails make the task more difficult. Make sure you start with drinks that have a lower percentage of alcohol, going up towards strength. In that case, any player can stop the game as soon as she feels dizzy. You are going to need one deck of cards and some alcohol-mixed drinks or shots. Although only two players at a time can play, the more players, the funnier. The game starts when the two players sit across the table and take one card each from the deck of cards in front of them. They lick the back side of the card (the decorated side, not the number) and without looking at it, stick it to their forehead. Then both players look at the other card and decide if their own card is higher or lower. After they make their guess, whoever gets it wrong takes a drink or shot. Then another pair of players takes their turn. If there are many players winners of the first round play the second round vs each other. This is one of the funniest bachelorette party drinking games that continues until there is only one person left. It can be even more awesome if you prepare a little prize for the winner – as they say, the winner takes it all!